Zambian Government has provided assorted humanitarian assistance to Malawi Government to mitigate the effects of flooding and tropical cyclone Idai valued at US$ 580,000. The humanitarian assistance includes maize flour, kitchen utensils, clothes, buckets and medical suppliers among others. 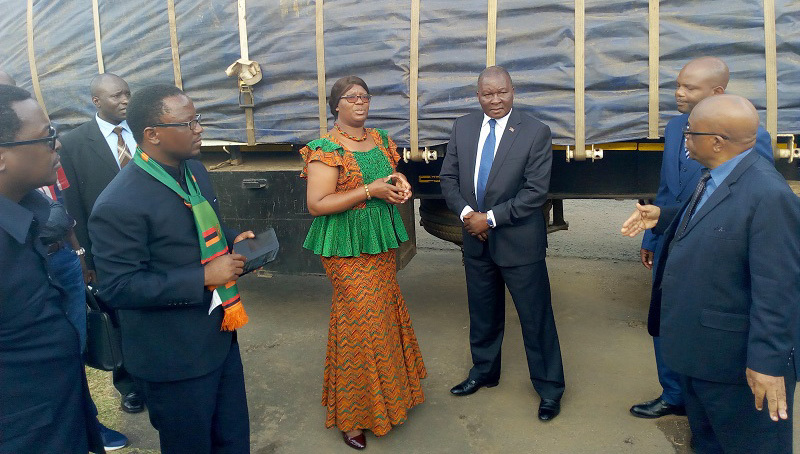 Zambian Minister in the office of Vice President of Zambia, Sylvia Chalikosa presented the humanitarian assistance to Malawi Minister of Homeland Security Responsible for Disaster Management, Nicholas Dausi on Thursday at Capital Hill in Lilongwe. Chalikosa said Zambian government was shocked to learn that some people had lost lives as a result of the effects of flooding and tropical cyclone Idai. She said the presentation of the assistance has come about after the country was declared a state of disaster with an appeal for emergency humanitarian assistance to the affected communities. The Minister explained Zambian government has managed to source the items in order to support the affected households. “Our support is being extended to Mozambique and Zimbabwe as they were affected with the effects of the tropical cyclone which resulted in flooding in some parts of the two countries,” she stated. Chalikosa pointed out that neighbouring countries need to sign Memorandum of Understanding (MoU) on how they could mitigate some of the effects of climate change and disasters in the near future. Dausi commended Zambian government for response positively by providing humanitarian assistance to affected communities in the country. He said the assistance has come at the right time where affected households are in great need of relief support. “I want to assure you that the assistance that you have provided to Malawi will be used to the intended purpose. The items will surely alleviate some of the suffering the affected communities are going through now,” Dausi added. He added that humanitarian assistance remains the only hope at this point in time and communities need to be provided with adequate basic needs for their survivor. Principal Secretary and Commissioner for Department of Disaster Management Affairs (DODMA), Wilson Moleni said affected householders still require humanitarian assistance to mitigate their effects of the flooding and tropical cyclone Idai. He said assessment teams have been deplored to the affected districts in order to come up with a comprehensive assessment report to be used in addressing the plight of affected communities. Over 173 camps have been set in the country.